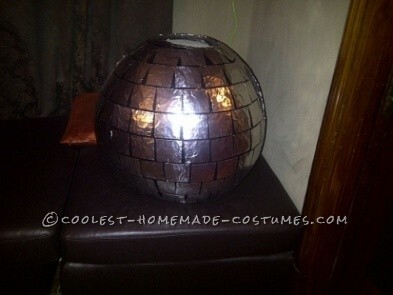 Are you going to a 70’s or disco themed Halloween party? 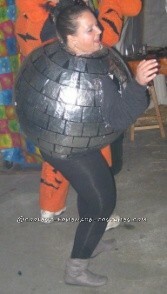 Well here is a perfect costume. Everyone will want to dance and party with you and you’ll be the center of the party all night. 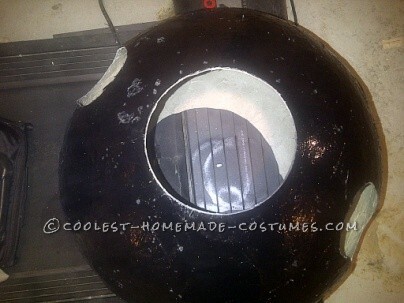 The costume was easy but time consuming because you have to let each layer dry thoroughly. Once I got through the paper mache part, the costume was easy and soooo fun to see come together. No one believed I would go through with it and they were so surprised to see how great the final results turned out!!! I received all my materials from friends or family – I only had to buy the balloon $7.00. I panicked near the end because I didn’t think I would fit through doors. I hung the balloon in the basement and when I finished the paper mache I brought the balloon up the stairs and was thinking I better fit through this door or else the last 6 days of paper mache have been a waste. Thankfully I fit through. 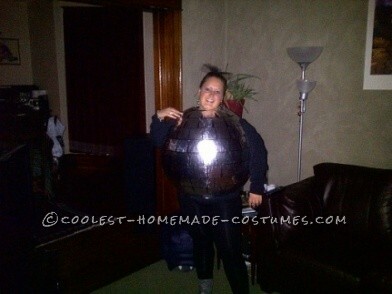 I had a blast at the party and won best costume. Purchase a 3ft balloon and blow it up (make sure the balloon can fit through doorways). 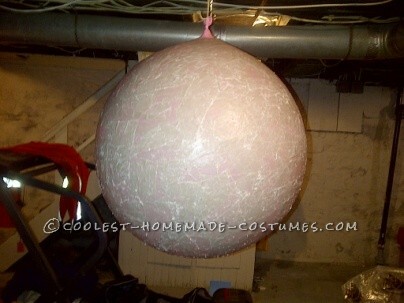 You want to get ready for paper mache so you will need to hang the balloon in an area where it can stay for a few days. This part is time consuming and will take few days depending on how fast each layer dries. Prepare your paper mache glue and newsprint. Apply 6 layers of paper mache (make sure you let each layer dry thoroughly before applying a new layer). 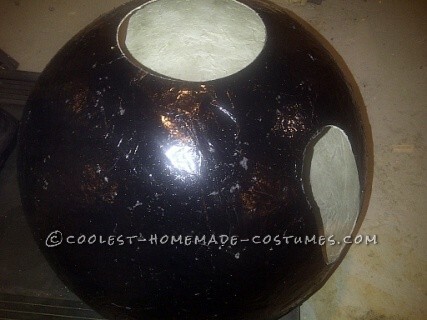 Once the paper mache is completely dry you can get ready for spray painting. 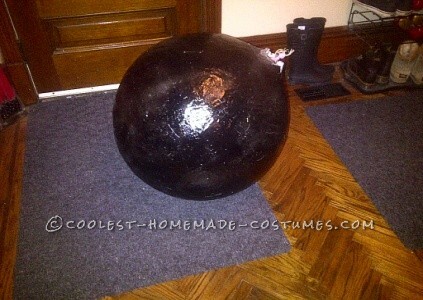 Spray paint the paper mache ball black (you might want to do 2 coats). Once the spray paint is dry you can measure where your arms and head will be. Cut holes for your head, waist and for your arms. Apply the tin tape or tin foil – whatever you prefer to use. I used tin tape (used to seal your ducts). I cut them into even squares so all I had to do was peel and stick. Optional – you can add pockets to the inside to hold drinks etc. I also download 100 top disco songs and played them on my iPod.